Evolution of Music is a complicated concept to demonstrate. It attempts to focus on the genres and the personalities that resonate with the audience at a given moment in time. It sheds light on the timelessness captured in the music through the assessment of music connoisseurs, music critics, radio and television programmes, presence on YouTube, Grammy Awards and ranking on the charts. In the book, Music in Everyday Life, Tia De Nora discusses about multiple modes of functionalities associated with music. The chapter on social powers of music becomes relevant in context of the genesis of this particular concert idea (The Evolution of Music) and its possible consumption. In this regard, Tia De Nora’s observation of Music as ‘a way of happening’, an extension of Auden’s commentary on poetry, brings to one’s notice music’s corporeality, materiality and its deployment as a series of aural markers. She specifically talks of the entrainment involved in the process of selecting features like ‘certain musical figures’, ‘genres’, ‘devices’, ‘forms or works’ which act as latches to make it happen. Through her ethnography, she explains why for some, “ ‘Juicy chords’, cha-cha-cha rhythms, slow ‘smoochy’ vocals, biographically significant pieces, formal developments”, are capable of evoking a sense of awakening and action. The attempt to animate certain aspects of western music in order to initiate the audience to a genealogy of the category makes this concert a vehicle of musical imaginations. The Western Music Society of Hindu College, ARIA wanted to present an element of timelessness to the music enthusiasts on the 21st of March 2016 at the Kamani Auditorium in Delhi. The show began with a Marian hymn, Salve Regina, composed during the Middle Ages and it came to a close with the works of recent singer-performers like Nicki Minaj, Taylor Swift and Adele with a finale from the Broadway, Beauty and the Beast. A variety of musical genres were represented through the works of Caccini, Bach, Donizetti, and Rachmaninoff on the one hand to Elvis Presley, Frank Sinatra, the Beatles, and John Denver on the other hand. This was followed by the chart toppers of Jimi Hendrix, Whitney Houston, Bob Marley, Eagles, Bonny M, Nirvana, and Michael Jackson. Then there were John Mayer, Mark Ronson, Amy Winehouse Jeff Buckley, Eminem numbers. For the Broadway and stage acting category, they chose to perform ‘All that Jazz’ from ‘Chicago’, ‘Circle of Life’ from ‘The Lion King’ and ‘Be Our Guest’ from ‘Beauty and the Beast’. 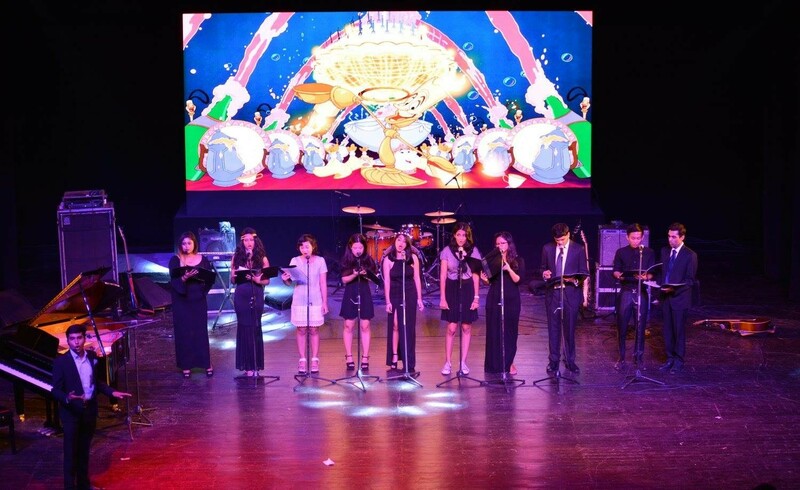 Sidhant Seth, the president of The Western Music Society of Hindu College, ARIA for the year 2015-2016 told that the idea of this particular show was conceived in December 2015. Once, it was agreed, February onwards, a full fledged vocal training began. This was followed by practicing with instruments in March. The Music society already had soloists, bands and instrumentalists but the choir was formed sometime in the mid year around August 2015. Sidhant is a classically trained vocal music student. He mentioned that some of the performers were classically trained as well, while few of them have their Rock and Alternative bands. However, many amongst them were untrained too. For the concert, they also had one guest pianist who played ‘Liebesleid’ by Fritz Kreisler arranged by Sergei Rachmaninoff. The choir, he said, had to be trained particularly for the 8 part harmony. The choir had made a commitment to rehearse about four times a week, when the show was announced. This was to ensure a proper vocal warm up session. This also gave them some time to practice the vocal techniques. The Bands held their rehearsals twice or thrice a week. While Sidhant looked into the rehearsal of the choir, the vocal training alongside directing them for the musicals, Ashrey Goyal, a pianist was in charge of training the instrumentalists. The band and solo acts were managed by the performers themselves. ARIA’s performances in the Delhi University circuit started gaining momentum. This made the society think about a slightly different concert theme when they chose their venue. After all, they were interested to spread their music to a wider audience. Sidhant felt that the most challenging aspect about this show was to let the audience experience how music is produced in each genre and in each period. They tried to bring in a Gregorian flavour echoing the sacral tones while they performed ‘Salve Regina’ for instance. He also spoke about the lights, sound and visual effects that had to be specially created during the Broadway performances like ‘Chicago’ and ‘The Lion King’. The shifts in vocal renditions had a wide range. When it came to the performance of the recent pop numbers – there was a need for a rounded yet not a completely big sound, to the use of nasal voice and throat voice. The Reggae required a raspy sound and the Rap projected a deeper voice. Finally, specific stylistic timbres were articulated when it came to performing the Opera or Jazz numbers. All of these quite effortlessly marked the changes that were characteristic of certain musical styles. There were occasional glitches. The sound of the bass line was stronger and fuller compared to the melody line in ‘Ave Maria’ but the joyful, romantic and well articulated tenor voice in ‘Come Paride Vezzoso’ along with some simple stage acting set the scene. What followed thereafter was a wonderful journey through various epochs. During some performances, they used karaoke tracks and when it came to handling the microphone, the team did well. The entire production had a larger than life feel to it and the lively host for the evening made sure that the audience had a good time. Personally, I really enjoyed the Rachmaninoff, Donizetti, Frank Sinatra, Jimi Hendrix, Bob Marley, Boney M, Mark Ronson and Jeff Buckley renditions. ‘All that Jazz’, ‘Circle of Life’ and ‘Be Our Guest’ also earmarked certain thrilling moments. All in all, musical imaginations had been played out quite deftly.